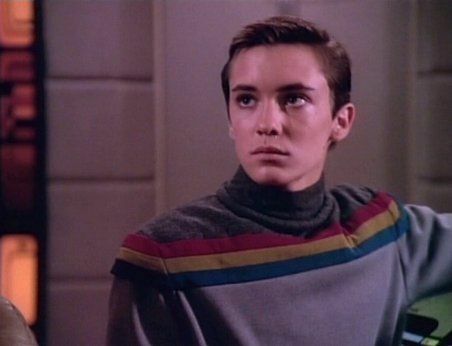 When Wesley was only five years old, his father, Jack Crusher, was killed during an away mission while serving on board the USS Stargazer under the command of Captain Jean-Luc Picard. Picard was forced to choose between saving another team member or Crusher, his personal friend, and Crusher ended up losing his life. Wesley would remember the look in the captain's eyes when he broke the news to Wesley and his mother. For some time, Wesley would remain angry at Picard for surviving when his father did not, although this faded as he got older. In time he came to understand the situation that Picard and his father were in, but unknowingly developed a fear of being faced with the same dilemma that Picard had to deal with. Ten years later, fifteen-year-old Wesley found himself living aboard the starship USS Enterprise-D when his mother, Doctor Beverly Crusher became Captain Picard's chief medical officer aboard the ship. Wesley often was a challenge and sore sight in the captain's eyes, even if he was the son of a good friend, because of the captain's disdain for children, although Wesley's astuteness and knowledge of engineering, as well as top grades on scientific examinations continuously impressed Picard. These same characteristics were, in part, the cause of Wesley suffering from loneliness early on, as his peers were intimidated by his bright mind – he also showed a tendency to take his duties almost too seriously. Wesley excelled at his studies aboard that vessel and through the primary school found himself participating in work-study programs alongside many of the Enterprise's senior officers. When in 2364 the crew of the Enterprise became intoxicated with polywater and exhibited unusual manic behavior, Wesley, who had also became intoxicated, took control of engineering, appointing himself acting captain Wesley Crusher and barricading himself in engineering, watching as Jim Shimoda pulled out most of the isolinear chips that controlled the navigational system of the ship. This put the Enterprise in danger when a stellar core fragment was hurtling in their direction. However, the incident did allow Wesley to display his knowledge of the ship's inner workings and he proposed that they turn the starship's tractor beam into a repulsor beam to push away the Enterprise. This move gave the Enterprise the extra time needed for Data to finish the repairs so the ship could move. In 2364, Wesley befriended The Traveler when he accompanied Kosinski aboard the Enterprise-D to assist with warp drive efficiency upgrade experiments. When the ship was transported millions of light years to the M-33 Galaxy, Wesley assisted The Traveler in returning the ship to their own galaxy. It was just before the Enterprise's return to its original position that The Traveler informed Captain Picard of Wesley's prodigious abilities, telling him that Wesley was a genius with the intricacies of time, energy and propulsion and that those talents needed to be encouraged. However, he emphasized that neither Wesley nor his mother should ever be told any of this, as it was important that the boy cultivate those abilities naturally without interference. Wesley was transported to a different quantum reality and the year 2379. Shortly after arriving Captain Picard, who was also very impressed with Wesley's contributions during that mission, granted him the field commission of acting ensign "for conduct in the true spirit and traditions of Starfleet." He told Wesley that whether that rank became permanent depended on him. He also instructed Commander William Riker to make out a duty roster for him to learn the ship and its operations from top to bottom so he would be ready for the Starfleet Academy Entrance Exam. His first official assignment as an Acting Ensign saw him on Voyager working with Seven, Cadet Tilly and Cadet Icheb on restabilizing the Barzan wormhole.